Advanced Asphalt Technologies, LLC, (AAT), which has provided state-of the-art services to the asphalt paving industry for twenty years, has found a new home in a 5,500-square-foot laboratory in the Burr Business Park in Kearneysville, West Virginia. AAT works with several government agencies, including the Federal Highway Administration. 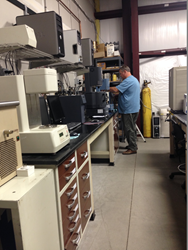 This technician is working with samples and studying ways to extend the staying power of asphalt. Our highly skilled workforce, proximity to major transportation routes and low cost of doing business draw companies to Jefferson County. We go to great lengths to attract high-tech small businesses like AAT. Advanced Asphalt Technologies, LLC, (AAT), a small engineering company that specializes in providing state-of the-art services to the asphalt paving industry, has moved into its 5,500-square-foot laboratory, having relocated to the Burr Business Park in Kearneysville, West Virginia, from Sterling, Virginia. In a recent tour of the facility, Ramon Bonaquist, Ph.D., P.E., Chief Operating Officer of AAT, told the Jefferson County Development Authority (JCDA) that AAT is one two independent labs in the nation that perform the same service to the industry. Three or four other labs in the country doing similar work are owned by construction companies that work exclusively for parent corporation. Established in 1979, the JCDA facilitates relocations and start-ups, supports existing businesses and works to improve the business climate and create jobs. Jefferson County is ideally situated for business, manufacturing and industry and is a major economic driver in a state that boasts the nation’s fourth lowest cost of doing business. For more information about the JCDA: http://www.jcda.net, info(at)jcda(dot)net, 304-728-3255.